"I think that the formation of [DNA's] structure by Watson and Crick may turn out to be the greatest developments in the field of molecular genetics in recent years. " In J.D. Watson and F.H.C. Crick, 'A Structure for Deoxyribose Nucleic Acid,' Letter in Nature (25 Apr 1953), 171, 738. Quoted in Francis Crick, What Mad Pursuit (1990), 66.
gives the series for the progeny of plants hybrid in a pair of differing traits." 'Experiments on Plant Hybrids' (1865). In Curt Stem and Eva R. Sherwood (eds. ), The Origin of Genetics: A Mendel Source Book (1966), 16. In the nucleus of each cell, the DNA molecule is packaged into thread-like structures called chromosomes. Each chromosome is made up of DNA tightly coiled many times around proteins called histones that support its structure. Chromosomes are not visible in the cell’s nucleus—not even under a microscope—when the cell is not dividing. However, the DNA that makes up chromosomes becomes more tightly packed during cell division and is then visible under a microscope. Most of what researchers know about chromosomes was learned by observing chromosomes during cell division. 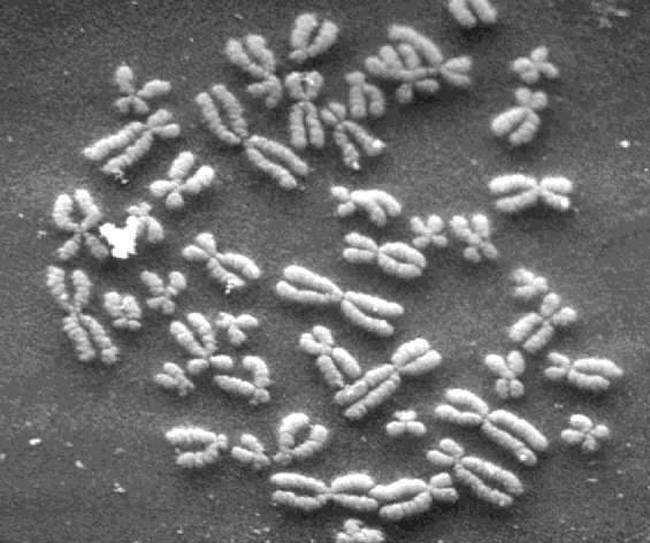 Each chromosome has a constriction point called the centromere, which divides the chromosome into two sections, or “arms.” The short arm of the chromosome is labeled the “p arm.” The long arm of the chromosome is labeled the “q arm.” The location of the centromere on each chromosome gives the chromosome its characteristic shape, and can be used to help describe the location of specific genes. "Remember when encyclopaedias were books, and not just websites? You’d have a shelf full of information, packaged into entries, and then into separate volumes. Your genome is organised in a similar way. Your DNA is packaged into large volumes called chromosomes. There are 23 pairs of them, each of which contains a long string of genes. And just as encyclopaedia books are bound in sturdy covers to prevent the pages within from fraying, so too are your chromosomes capped by protective structures called telomeres." Follow this link to the whole story by Ed Youg, at National Geographic. Wednesday: Watch TRANSCRIPTION - TRANSLATION VIDEO and take Cornell Notes AND complete worksheets that we couldn't finish in class. DRAW AND LABEL Fig. 11.3 p. 284Tuesday: Complete any in class notes. WHAT IS A KARYOTYPE VIDEO?